Angela has been with North Star Chiropractic Center since the beginning of 2013. She works double duty in the office as a Chiropractic Assistant and as the Insurance Billing Manager. 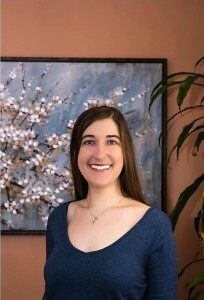 She’s your go to person if you have any insurance benefit questions, and she’s also happy to help with appointment scheduling or general questions about chiropractic care. She loves being part of a team that works together to aid people on their way to reaching their health goals. 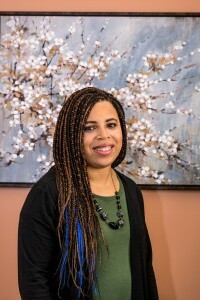 Angela was born and raised in the Seattle area, and graduated from Western Washington University with B.A.s in Psychology and English Literature. When she’s not in the office, Angela spends most of her time dreaming up cooking projects and perusing her ever growing cookbook collection for inspiration. She enjoys hosting dinner parties for her friends, baking bread, and maintaining a large vegetable garden. Lovey has been a part of the North Star Chiropractic Center team since mid-2015. Aside from being a Chiropractic Assistant, she manages requests for records, assists with checking insurance benefits, and monitors both the website and social media networks. She loves working for a company that encourages one another and is built around the values of helping and educating people about their health. Lovey is a Seattle, WA native. She is a veteran of the US Army and earned her Associate in Technical Arts degree in Event Planning at Edmonds Community College. She was featured on King 5’s New Day Northwest as an advocate for the Multiple Sclerosis community in 2016. When she is not in the office, she is on the go taking care of her 5 children and co-leading a local MS Support group.